The Billboard Music Awards went down on Sunday night (May 20) at the MGM Grand Garden Arena in Las Vegas. The show had many moments inspired by recent real-world events. Including host Kelly Clarkson’s tribute to the victims of Friday’s mass shooting at Santa Fe High School in Texas. There were wins for Taylor Swift, Luis Fonsi, Khalid and more. Here are some tickets, shirts, vinyls, and CDs by Ed Sheeran on 5miles. 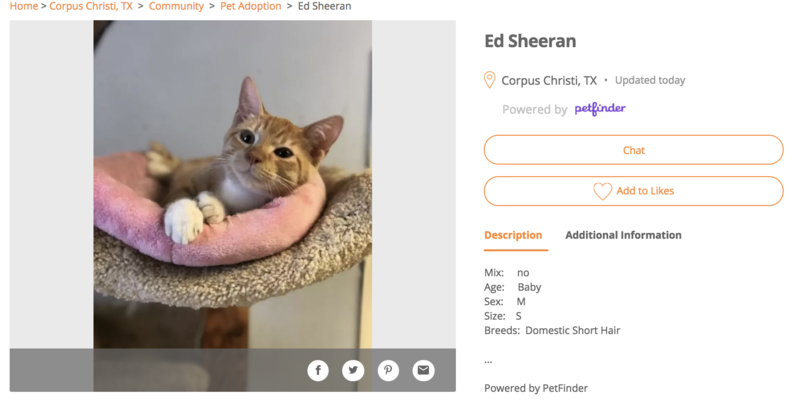 Even better, here is a cute little kitty named Ed Sheeran waiting to be adopted! Listed by our friends at Petfinder! Vintage Collectables and Facts To Celebrate Coca-Cola Day!